Wisconsin Canoe Trailer built to last! 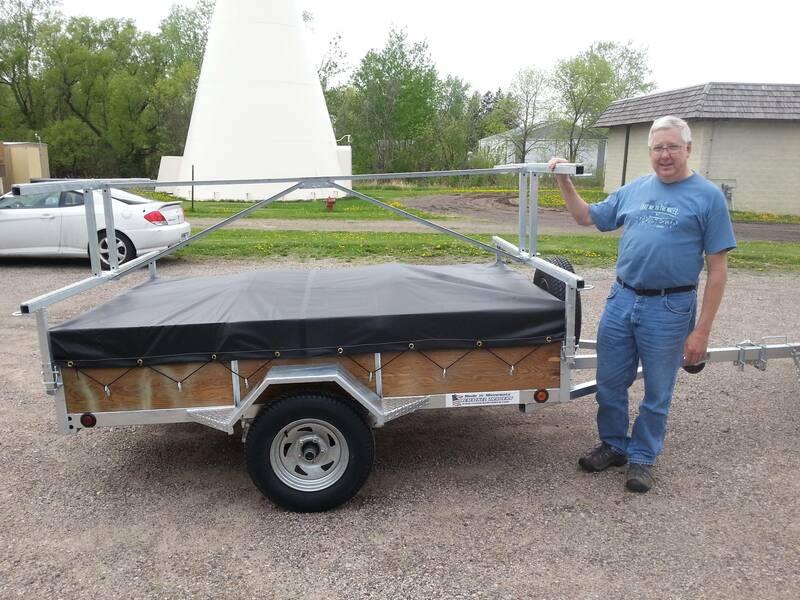 Bob meet us a Canoecopia in Madison, Wisconsin and bought the 4 place canoe trailer with 16″ sides. He choose to upgrade his trailer lights to LEDs, which we recommend. Bob’s Wisconsin canoe trailer is built of hot dipped galvanized steel, which prevents the trailer from rusting. He loved the idea that the canoe racks were easily removable so he could use it as a utility trailer when he needed it. Bob and his wife drove around 5 hours one way to pick up their 4 place canoe trailer. We sell two types of 4 place canoe trailers, one with 16″ sides and one with 24″ sides. The reason someone might buy the 16″ sides versus the 24″ is that a 16″ side lovers the height of the top rack from 5’11” on a 24″ side to 5’3″ on a 16″ side. Some people like the lower top rack so they don’t have to reach to load up their canoes, kayaks, or paddleboards. Remember we can also ship our 4 place canoe trailer to your house. Our shippable canoe trailer is a 5’x7′ trailer bed with a 6ft tongue. Call or email us to get a shipping quote! 651-464-2889 or email us remackeltrailer@aol.com. Let a Remackel Trailer be the last trailer you will ever have to buy. We have to admit Bob and his wife are some of the nicest people we have ever met. Thank you for your purchase! Details of Bob’s 4 place canoe trailer….